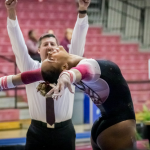 Perfect handstands, releases that float to the heavens before touching back down, stuck dismounts all around, there are a lot of things to love about bars. From freshmen that we haven’t seen in a while to veterans looking better than ever, these are some of our most anticipated routines for 2019. There’s really only one reason Al-Hameed is one of my most anticipated bar routines and it’s her absolutely stratospheric Tkatchev. Seriously, it’s near Gabby Douglas height. No joke. And I’m just as excited to see the crowd’s reaction to it when she performed in Stegman than I am for the routine itself. Have you seen her training at Florida so far? If so, you’ll know why she’s one of my picks. Her releases are looking better than ever and we all know her form is to-die-for. If she doesn’t get a 10 in her first home bar routine—yes, really—I’m rioting. She’s BACK she’s back. And she has upgrades on bars. There’s a van Leeuwen in this set now, and some updated construction. It’s gorgeous. I could watch her lines all day long. Do I really even need to explain this? Washington’s precipitous rise the last three seasons has come without the help of a single perfect 10—the team’s most recent was in 2005. A 10.0 feels like the next step in the Huskies’ renaissance, and Riley’s stunner of a bar routine—which went as high as 9.950 in 2018—is a realistic possibility. The senior had an injury odyssey in her early days in Seattle, and I hope she gets to go out on a high. Michigan freshmen Abby Brenner and Natalie Wojcik have already proven their star power, but the other half of its class is returning from injury this year and will have a more gradual affect on lineups. Don’t forget them though! Heiskell’s toe point is truly ridiculous and her J.O. 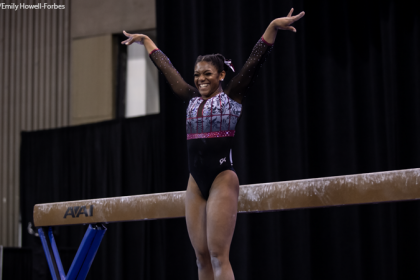 scores reflect her beautiful technique, especially on bars where she hasn’t missed a routine since 2015. She’s still working back from a 2018 Achilles tear, but she’s a future star on this event. 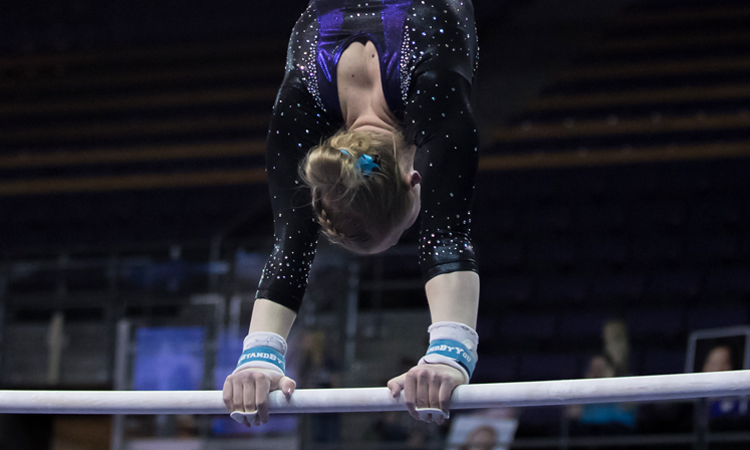 Murakami just snaps into her bar positions, making her routine very satisfying to watch and leaving no question as to her handstand positions. In a freshman class full of incredible talent her precision really stands out. With the abundance of Jaegers as a release move in NCAA it takes a lot to make one stand out to me. However, Schoenherr has great form and height on this and her counter rotation out of it into her swing is incredible and really sets it apart from the crowd. 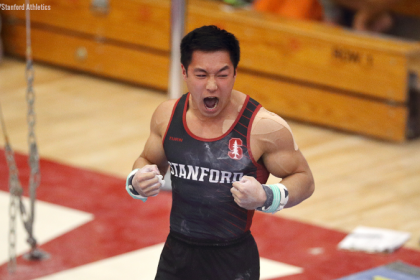 Lewis scored a career-high 9.750 during event finals at nationals last year—and that was even with a big step on the dismount! She has some of the nicest lines and the extension on her Jaeger to bail connection is unmatched in DIII. With a controlled landing, she should be right up in contention for a conference or national title. Talk about swinging aggressively! Kachinsky goes all-out every time she steps out to compete and has one of the biggest Geingers I’ve ever seen. After winning the bar title at WIAC Championships, Kachinsky was poised to take one of the top spots at nationals. However despite a pretty good showing, she missed out on the podium. I’m excited to see her get back out there and fight for a top three finish.